Using Nintendo's favored method of new game announcements – Direct presentations – The Pokémon Company has now released a brief trailer giving a quick look at the new Pokémon games. 2018's Pokémon Let's Go: Pikachu and Eevee games acted as a sort of reboot of the original Red and Blue titles for the Nintendo Gameboy, and for many didn't count as a 'core' Pokémon experience. 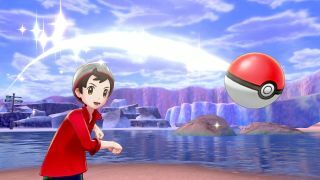 Pokémon Sword and Shield are the first mainline Pokémon games to come to Nintendo Switch, and expectations will be high. The presentation doesn't give too much away, but you can see the first glimpse of the environments and art style in the trailer below – without any in-game footage. As spotted by We Got This Covered, a (now removed) tweet by Nintendo of America suggests Pokemon Sword and Shield will see Gym Leaders replaced by Gym Masters. The tweet was accompanied with images showing in-game soccer stadiums, suggesting these will serve as gyms. We know the game is set in a brand new region of Galar, rather than a rehash of Kanto or a previously visited territory. Galar seems to be loosely inspired by England's cities and countryside, with rolling hills and brickwork cities to explore. The trailer also showed glimpses of jewel-encrusted mines and what might even be a football stadium (see the kit below), though we're waiting to see whether competing in a Pokémon-themed Football World Cup will be possible for players. Sword and Shield look to retain the look and 3D animation style of the Pokeémon Let's Go games that launched on Nintendo Switch last year. Pokémon games haven't been flat 2D games in years, and has increasingly been moving towards full-size avatars and 3D environments. Some may miss the old-school pixel charm of the earlier games – and find the 3D creature models a bit bland – but for better or worse this is what we're getting. After the release of the simplified Pokémon Let's Go titles, there had been concern amongst fans that the 2019 RPG wouldn't offer the full gameplay experience they came to expect from mainline Pokémon games. Head of the Pokémon Company Tzunekazu Ishihara assuaged these concerns in an interview with Famitsu magazine (via Siliconera). According to Ishihara, the 2018 Pokémon release will be a "completely different game" to Pokémon Let's Go. "It's is not an entry game," he says, "but a game that we want long term fans of the Pokémon series to look forward to." Unlike the Let's Go games, it looks like Sword and Shield will be maintaining the random encounters so core to the usual series' gameplay, for example. We don't have much to go on aside from the recent trailer, though with a 2019 release we're sure to see more of the titles at E3 2019 in June. The Sword and Shield titles seem out of character for a series used to using colors and letters to list its titles. The England-setting is curious given the titles, though. Our instinct says we could see a spin on Arthurian legend, maybe with players facing off against the Knights of the Round Table? It certainly wouldn't be the most far-fetched thing we've seen in a Pokemon game. What still confuses us is that we've been waiting for the long-rumored Pokémon Stars game for over two years now, after a 2016 report published by Eurogamer. published a report in late 2016 that said multiple sources had confirmed a new version of Pokémon Sun and Moon was being developed for the Switch under the code named Pokémon Stars. Suffice to say it never materialized. 'Stars' could well have been a code-name for what eventually became the Let's Go games, or could still prove a Switch port for the Sun and Moon games. That's everything we know. Now let's get into the things we'd love to see from the rumored game. As the only other Pokémon games to have come to the Switch, the ability to trade and battle with Pokémon Let's Go games is an obvious feature to include in the new games. Being able to bring new eighth-generation Pokemon to the Let's Go Kanto region, too, would be a neat perk if Game Freak allowed it. The Let's Go games put the Joy-Con controller's motion controls to use for throwing Poke-balls, though we could imagine some other fun uses for Pokémon mini-games. Boxing with a Hitmonchan? Steering a surfing Lapras? Fishing on the Galar shoreline? Just give us things to do.